Okay, folks. 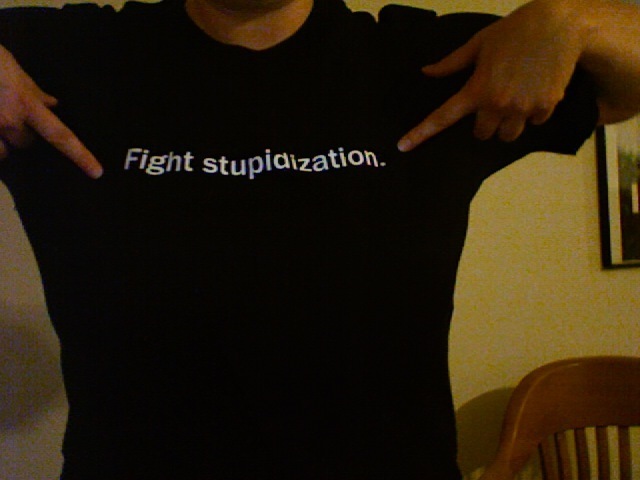 The FIGHT STUPIDIZATION tee shirts are here. I have mens (M, L, XL, 2XL) and womens sizes (S, M, L, XL). Be warned that the womens sizes run pretty small. Shirts are $10 each if I can meet you and do a hand off, add $5 per order (not per tee shirt) if I will be mailing them to you. Please email your order to fightstupidization (at) gmail (dot) com, and I’ll respond with your total and my PayPal address. I’m not far from Montrose/Heights/downtown and will deliver to those areas. Otherwise, I’ll pop ’em in the mail for $5. UPDATE: I’ll be at Onion Creek in the Heights from 2PM until 4PM this Saturday, April 16. Swing by with your $10 and pick up a tee shirt. What size shirt are you wearing in the photo? That’s a mens large. I typically wear a mens medium in tees, but I found that size a bit snug in this brand of shirts. You could prob do a M in mens.